Greetings Tolsen, I do like your sense of humour. I did a search of this site, : "smart 450 hand brake tool" and got a few hits. If by chance you had the dimensions in one of the photos, not much help sorry, as most of the photos had "go to photo bucket to update photos". I left my bucket at the beach and I've not bought a new one yet. I also like you description of the stainless steel russian tent peg (do they make things to last??? do you see many old lada's nowadays???) and massey ferg tractor. I can handle M Fergy but didn't realize the russians were related to the irish? A tent peg with a square hole at one end and a right angle bend at the other??? A tent peg as I know them, have a angle hook or round ring at one end and a sharp point at the other. So, just a total length dimension and size of the square hole would help. Cheers, Ian. Tool overall length is 265 mm. Square handle end measures 60 x 60 mm but non essential size. See post #16 for business end size. Greetings Tolsen, Thank you, much muchly. Yes, I'd already noted the dimensions of the business end. And also thankyou for going to the trouble of making it. Pictures are worth a 1000 words. It's not the sort of tool you'd use often but it's also the sort of tool that is bloody handy when you have to with little time to make when you do need it. I don't know were I got the idea of it being stainless? Reading again, you mentioned just steel. I must be getting old. Grasped the ferrule from below with Mole Grips and wrestled the clip into submission. Attempted a tool (alloy plate with 10.5mm drilled hole, gripped in Mole Grips) but didn't have the strength in my hands to pull all the way. Maybe contributed to weakening the catch. No swearing (remarkably!) - prayers for the rain to stay away long enough to make some progress. Today will be similar I suspect. If I fit inboard end first, does the outboard end have to be fitted before the shoes are refitted to the back plate, or can it be fitted with the shoes already on the back plate? Not so piggish after all. Only concern is six handbrake clicks before fully applied. Is there a limit for MOT? Is the only adjustment the 'self' (ho ho) adjusters within the drums? I can pull my handbrake six clicks but most mortals will then struggle releasing hand brake lever. Mine applies brakes after one click. Two clicks will hold car on a steep hill. Adjustment is automatic both for cables and shoes. Adjuster mechanism on shoes may be incorrectly fitted as quite common on Smarts services by Smart or other garages. Above written before driving. Long pedal also - despite bleeding. Time to ramp the adjusters right up I think. Confirm adjuster mechanism and springs are correctly fitted and working. These are the shoes where I debonded the linings and glued them back on in different positions to make eternal life brake shoes. 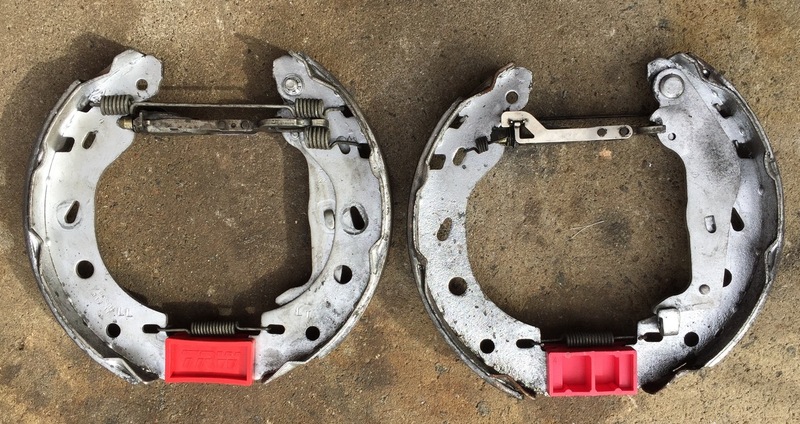 Replaced the NS adjuster with the original from the car when shoes replaced and it is in good condition. Viewed from the rear, the adjuster ratchet rotates ACW to move shoes outward toward the drum - correct orientation? The OS adjuster was replaced with new shoes (years ago) and I'm away to check it and tighten it up. Can't see why manually adjusting won't cure the long pedal and long HB lever travel (5 clicks but a long way until the first) as there's no other adjustment option. It feels - on the pedal - like stretching springs before the linings contact the drum. There is nothing amiss on the fronts and I bled all four corners yesterday.